Macintosh G4 - What a find!!! Who doesn't love an old computer? I love old computers. I love'em as much as the Globglogabgalab loves books. 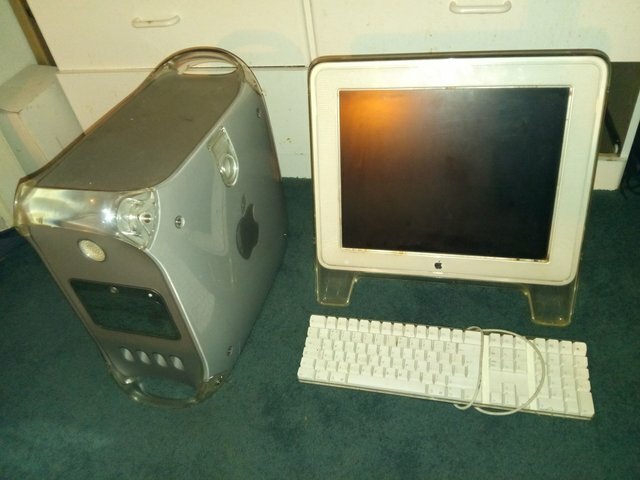 Folks, I found a G4 Power Mac! A good chap on offer up had it listed for not more than 1 minute and I up an snatched it! $20! That's a steal! Check it out. These machines won't get you where you wanna go on the information super highway in 2019, but they are actually to be treated like old game consoles. Your NES won't play XBOX games, but it will play NES games. I think you get the idea. G4 Power Macs will do what they were intended to do and that's run Unreal Tournament!!!! American McGee's Alice and lots more! Trust me, Mac OS 9 has a library, and this is the sweet spot for pre-Intel Macs. It was a lucky find, these machines can run anywhere from $300 - $800 depending on how much an individual wants them. This is, after all, the 1.25GHz MDD model, sporting a Radeon 9000 and running OS 9 natively. It doesn't get any sweeter than that. The 2GHz models are almost unheard of, but this one... if I had to let it go (which I never will), I would appraise it at a reasonable $500. Definitely not any lower. If one does find lower, you buy that sucker and scalp the hell out of people! That's all for now, I just wanted to share my guilty pleasure. There it is in all its Glory. Maybe I'll demo it next post. Signing off. Anyways. Were you actually able to use metal 3d printing to make a functional music box comb? and where did you have this work done/ what specific materials and processes (if you can remember) Any info would be super helpful!! Hi sorry I am glad to see a reply x) I know steemit doesn't give alerts, but are you referring to this video? I may also have talked about it on another vid, I cant find it. I had one person attempt to make one for me with metal and it didn't sound too good :/ I think there's lead in the real combs that is required for a real monophonic tone, otherwise they sound like springs, hard to describe, it's just a no-go... maybe needs more experimentation. The company I went with no longer produces them, but there was one that did digital recordings for snow globes (not the beeping kind, but they use real wav file recoridngs). For now, I have no one to make any metal printed ones for me. You wrote: "These things are horrifically expensive to produce. Some company actually wanted $5,000 to press the melody, then $1500 for an order of 500 units minimum. Decided to go the Metal 3D Printer rout. The units sounded identical, if not maybe even better than machined units. Total cost: $250 for 500 units. Way to go 3D Printing!﻿"
Sounds like this endeavor may be the one you described above as sounding too spring like? ya that's the one. thanks. they don't do those no more too.